Istanbul is one of the truly great romantic cities, straddling the Bosphorus with its skyline studded with domes and minarets. Today it hums as Turkey's cultural heart and good-time capital. 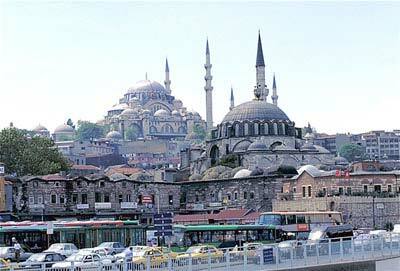 Its history tracks back from Byzantium to Constantinople to its place at the head of the Ottoman Empire. In this city you can tramp the streets where crusaders and janissaries once marched; admire mosques that are the most sublime architectural expressions of Islamic piety; peer into the sultan's harem; and hunt for bargains in the Grand Bazaar. Side by side with Old Istanbul you'll find hip bars and clubs, flashy executives, malls and haute cuisine. All this history, hustle and bustle coexists around the spine of the Bosphorus, a constantly busy, heaving mass, dotted with ships and ferries, which provides the link between Europe and Asia. There is a rich arts culture, opera, music, cinema, which nods its head to the Ottoman and Byzantine ways while taking cues from Europe. Istanbul has architecture, art, nightlife, cuisine, history, religion, shopping more than enough of it, at prices which are among the lowest in Europe. Around 657 BC, a man named Byzas established a town on the site of present-day Istanbul, prompted by the oracle at Delphi. Although conquered by Alexander the Great and eventually subsumed by the Roman Empire, Byzantium fared pretty well until it annoyed a Roman emperor by backing his rival in a civil war, and it was subsequently destroyed. 330 AD: A new city was erected at first called New Rome but quickly rechristened Constantinople in deference to the new Roman emperor. Constantinople was regarded as the capital of the Eurasian world, thanks in large part to its magnificent architecture, many of the Christian churches and palaces, as well as the impressive Hippodrome, are still visible today. In the time of Emperor Justinian in the 6th century, embellishments to the city continued as the Eastern Roman Empire grew in strength. Over the next few centuries the city weathered attacks by the armies of the Islamic and Bulgarian empires, but the crusaders finally sacked it in 1204. The city was reclaimed by a rejuvenated Byzantine Empire 50 years later. 1453: The fall of Constantinople occurred when the Ottoman army of Sultan Mehmet II took the city. It was under the Ottomans that a classic mosque design was established and many other great buildings constructed in the city, which was soon renamed Istanbul. 18th century: The Ottoman Empire overextended itself militarily and went into a decline, accentuated by the fact that it was well behind Europe in the areas of science, politics and commerce. This led to modernisation attempts and in-fighting, including the eventual slaughter in Istanbul of the janissaries, the sultan's bodyguards and a prominent symbol of the old regimes. 1832: Ethnic nationalism ultimately splintered the Ottoman Empire. Greece asserted itself, with Bulgaria, Romania, Albania and the Arabs primed to follow suit. Meanwhile, other European powers were getting ready to squabble over the geographical pickings. 1853-56: Russia tried to pressure the Ottomans for control of the faltering empire's subjects, but the unfortunate result was the Crimean War, fought with British and French support for the Turks against encroaching Russian power. 20th century: was greeted with more nationalist uprisings in Macedonia, Crete and Armenia, and Turkish stability hit a new low after the country opted to side with Germany during WWI, the result was the British occupation of Istanbul. 1923: The Turkish War of Independence, during which revitalised nationalist forces fought off invaders from Greece, France and Italy, finally led to the birth of the Turkish republic. All that changed during the 1980s and 90s, however, when Turkey experienced an economic and tourism boom, and Istanbul is now re-staking its claim as the 'capital' of the eastern Mediterranean. The seat of the new nation was established in Ankara, and Istanbul, no longer regarded as a political or cultural powerhouse, was relegated to a back-seat role in terms of its prominence as a city. 1999: on 17 August, unfortunately the shine came off its tourist-friendly reputation when, an earthquake measuring 7.4 on the Richter scale devastated an area 90km (56mi) east of the city. It was enough to put a severe kink in Istanbul's tourist industry, although numbers are now beginning to rise to pre-earthquake levels. A boom in prosperity conversely contributed to the disaster; jerry-built structures, erected ad-hoc in an attempt to cash in on the economic windfall, folded like matchstick models and fatalities numbered in the tens of thousands.